There's nothing as awful as showing up at a race in a hurried whirl of chaos and realising, five minutes before the start, that you forgot your safety pins/MP3-player/running fuel at home. There's a very good reason why (most) runners lay out their race day gear the evening before a race (i.e. before the race-day nerves kick in) - it works. Do it. 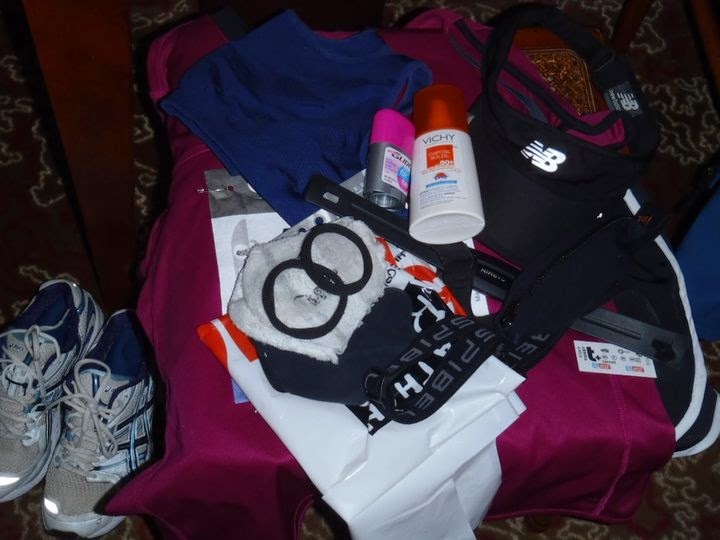 My pre-race spread for the Paris Marathon in 2011. There's nothing as reassuring as knowing that you've done your training and prepared well for a race. Sure, there will still be nerves and butterflies, but doing your part before a race is definitely the greatest gift you can give yourself in terms of race-day morning peace of mind. A race is a celebration of months and months of training and flights and flights of stairs run! Note that I didn't say "be on time". For me the only way to start a race in a calm and relaxed way, is to show up early. This will give you time to study the route map, warm up properly, hit the porta potties (again...) and get those nerves under control before the start. Give yourself time to hit the porta potties again. And again! Although adrenaline surely does most of the work here, I'm a big fan of having a visual motivation cue with me when I run. For me it's my Endorphin Warrior "believe" bracelet, or I might even write my mantra on my hand ("You can do this!"). Whatever works for you. I think this is my favourite tip of them all: Don't get so swept up in pre-race hype and nerves that you forget to enjoy the experience. To me a race is a high five for all the many, many hours spent training out in the heat/rain/wind - it needs to be celebrated! Make a concious effort to take in the scenery, enjoy the spectators' cheers and to relish the joy of running. 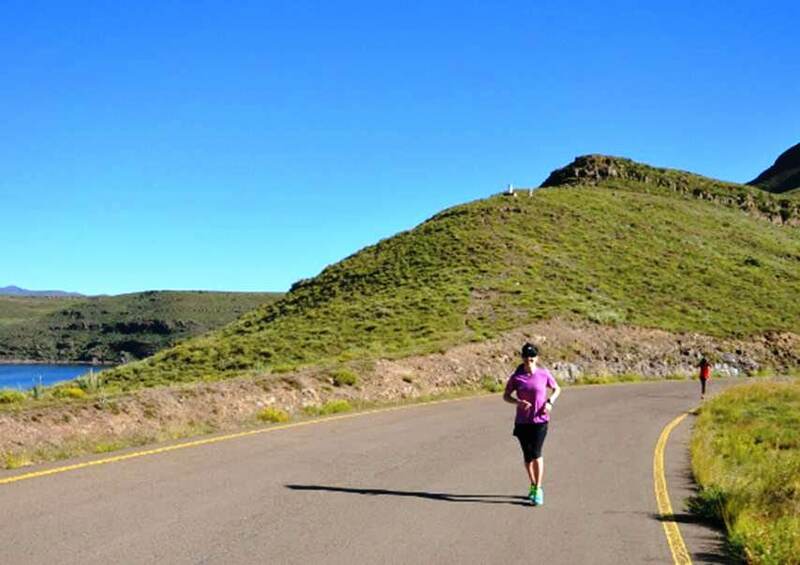 Running the Highlands Trout Mountain Challenge in the Kingdom of Lesotho. The breathtaking Maluti Mountains are forever etched into my memory! I always make sure I have everything laid out the night before the race. One less thing I have to do race moring. Cute bracelet. Me too - I need every single minute I can get in the mornings, haha! Being organized is key for me or else I forget stuff!! Being there early also relieves stress! I am obsessively early at a race. I often do big races with tons of people so its not always easy to find your way around. Sometimes that means sitting in my car or a cafe for an hour... but better than showing up 10 minutes before in a panic. I couldn't agree with you more, Karen - showing up early just takes so much stress out of race day. Especially with bigger races. I'd also much rather wait a bit than arrive late and be all stressed out. Have a great race today!! I used to want to show up at the race just in time to run so that I wouldn't get too cold but now I found that your #3 is way better. Having time to go to the bathroom and do a little warm up run makes a huge difference. Thanks and enjoy your race! Thanks so much, Diane - much appreciated! My race went really well - I'll do a recap on the blog soon! Love the one about being present. It is so true. So many people run with their head down, not necessarily literally but figuratively. I've run so many races where my faster friends say at the end that they did not see a thing! I guess it's one thing if you are running in the same location over and over again, but a new race in a new place? Head up people and open your eyes and your minds! Have a great weekend! AMEN!! When I race in a new location, I literally DRINK in the scenery - love seeing the world on the run! Great tips. I try to make things as stress-free as possible, so laying out my clothes and getting to the race early really make things much smoother! So true. Arriving early is a bit of a challenge with two toddlers, but so worth it, haha! I can relate to the being prepared one. I ran a 10K in March and had Flat Me ready, had everything all set to go...got there and had forgotten my CHIP! OY! Thankfully it was a small race so they just wrote my time down. I was so frustrated though. Now I have a checklist I go through the night before so I don't forget anything! Love "Flat Me", lol! Great idea to have a checklist - I really should get one too. Especially for out-of-town races - forgetting something then always leads to unnecessary last-minute purchases :( . All of these things are what I do prior to a race as well. And I usually double and triple check my gear just to be sure. I also have the Garmin 220 and love that watch! LOVE my Garmin 220 - hope it lasts forever and ever! I am right with you on the organization and being there early. I would rather be all set and have plenty of time to walk out my nerves than be rushing to make it to the finish line. Me too, Jennifer - rushing to the starting line just makes me start a race off on the wrong foot. Not a fan at all! Be well prepared is not anymore for me: I only race for fun now, to feel the atmosphere, to enjoy the events. 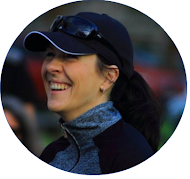 I personally think that running for the pure enjoyment thereof can also be a really good running goal - for me races where I ran with family or friends just for the joy of running are often much more of a highlight than clocking a solo PB. Being early is so important on race to to give plenty of time to calm those pre-race jitters, to use the bathroom and time for those race day rituals. I totally agree - I hate starting a race in a mad rush!